One day there won’t be Women’s History. One day there’ll be People’s history, encompassing each gender, race, age, culture and ideology. Until this elusive future ideal, books which focus on neglected aspects of our past are crucial to present the fullest, fairest perspective. 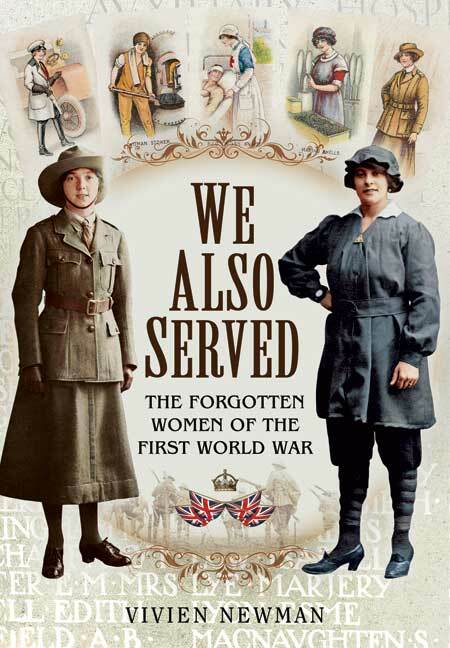 We Also Served – The Forgotten Women of the First World War by Vivien Newman is a timely overview of experiences rescued from oblivion. Here are women once lost behind the filters of indifference or deliberate censorship, now made visible again through accessible scholarship and engaging writing. Newman explores facets of history which, thanks to the First World War Centenary and a new generation of historians, are almost familiar to the modern reader – munition workers, medical personnel, servicewomen and spies. It would be easy to reduce a myriad of lives to neat stereotypes – the nurse, the WAAC, the factory worker – but Newman avoids this by drawing on a good variety of sources, and by combining analysis with first-person accounts. It is the voices from the past which add an important human element to the historical overview – voices which deserve to be heard. Among all the details and observations in We Also Served Newman rightly places the experiences of women in the First World War on an equal footing with those of the men. There were few women engaged in martial combat during the war, but they had their own fights; their own victories and casualties. Heroism or suffering on the battlefield are surely no longer considered the key requirement for a name being remembered on the roll call of history. Valorous deeds may have been underrated and unrecognised in the past, but Newman’s work clearly shows the courage is there regardless. And not just courage. We read of ambition, excitement, frustration and exhaustion. Also, hope… and grief. In one anecdote, Newman draws attention to the fact that when munition worker Lottie Meale’s husband donated a photograph of her to the Imperial War Museum, he inscribed the memorial message – “died of TNT poisoning contracted on duty.” He did not consider her sacrifice any less significant than those of the poor blokes killed abroad. There is, of course, more to know. Each chapter of this book could be expanded into a volume of its own. There is always more to know and more to explore. Each life could have its own dedicated history (some of them do – the bibliography is helpful on this score.) Newman’s book is one of several general WW1 histories which will inspire the even more specialist works which the subject so rightly deserves. We Also Served ends with the words of WRAF servicewoman Florence Green, who, at the grand age of 110, told a reporter: “I was proud of my service.” Newman can rightly be proud of hers too. The city of York has a long, vibrant and occasionally violent history. Until very recently the four years of the Great War have been comparatively overlooked by historians and memorialists. Books, TV programs and films had previously focused only on the military aspects of the war. Thanks to the war’s Centenary we now have a far greater appreciation of how immense the war’s impact was on all levels of society… and on the Home Front too. 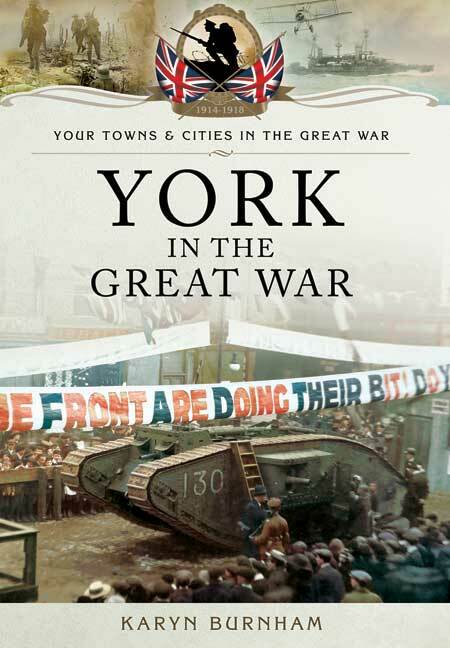 Karyn Burnham’s history York in the Great War is part of a neat series by Pen and Sword books. As such, it suffers under the constraint of the series’ word limit. Frankly – it’s too short! Happily, what we have is a nicely-researched, well-written overview of a fascinating city during a tumultuous era. York in the Great War will enable locals to see their city with fresh eyes, wondering – Was this where the Zeppelin bombs fell? Was this where the women from the Cocoa Works had their allotments? Did troops march down this street? In York in the Great War details of daily life touch on so many aspects of the wider war, both home and abroad. For example, the book covers issues about recruitment – and conscientious objection. We read of the welcome given to Belgian refugees… and the fearful bigotry behind the internment of so-called ‘enemy aliens’. Zeppelins raid; food is rationed and influenza strikes. 1559 days of war are endured, until the bells of York Minster are free to peal again in peacetime. Adding to the book’s appeal are previously unpublished images from the collection of local historian, the late, great Hugh Murray. Above all, it is the personal stories which make this book a treat. My favourite? The tale of Sgt T.J. Williamson of the 5th King’s Own (Royal Lancaster) Regiment. His life was saved during the second battle of the Somme when a potentially fatal bullet was stopped… by the tin of Elect Cocoa sent out as a ‘comfort’ by Rowntree’s Cocoa Works.